Is there anything more annoying than trying to accomplish a task without the proper equipment? Whether it’s trying to cook up dinner in a too-small pan or charge your phone with that slightly-defective cord that only stays plugged in if propped up in one specific way (argh!). Working with tools that are not quite right can drive you up a wall. The more important the task, the more frustrating it is to have a tool that isn’t helping you succeed. 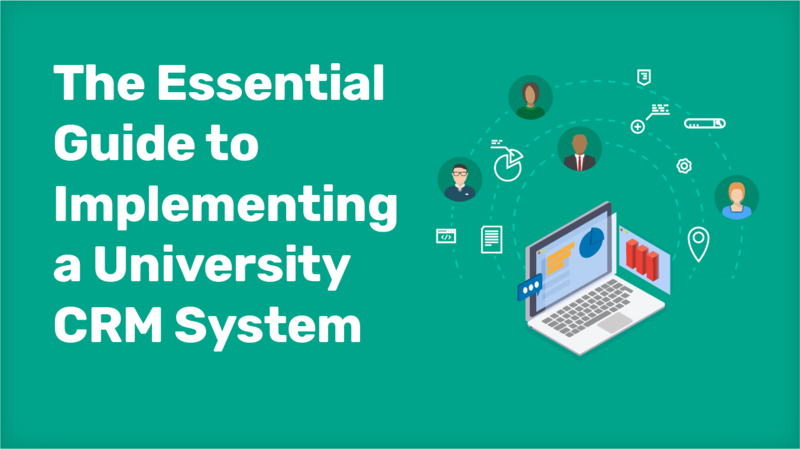 So, it’s no surprise that many universities, high schools, and language schools feel incredibly irritated by customer relationship management (CRM) systems that don't meet their needs. If that sounds familiar—and if you wish you had more guidance on how to set up a system that will actually work—keep on reading. The Intead team is gearing up to present our AIRC full-day workshop on December 5 followed by some great learning and networking at all the conference sessions. If you are going, please be in touch (info@intead.com). We'll be at ICEF the following week in Miami and welcome a meeting there as well. Now about those CRM systems...why is everyone switching to Technolution's #Slate, anyway? First off, let’s define our terms. A CRM is a piece of software that helps you manage and analyze customer engagement throughout the customer lifecycle. A marketing automation platform (MAP) helps you manage the digital promotions you are launching and measure their success. This post will focus on CRMs, but these two tools are interrelated and both are really important to your work. In student recruiting, CRMs are crucial to keeping your prospective students engaged. Knowing when and where they entered your system (by download, by email, via social, etc.) can inform what types of information they should continue to receive from you. And of course, you want to nurture your leads all the way through to enrollment. A good CRM, set up well, is going to help you stay connected beyond graduation. Tied to your Student Information System (SIS) the goal is a full customer journey experience that helps with recruitment, retention and then the all important alumni engagement. At Intead, we use HubSpot to manage our own marketing automation (including this blog) and our leads. For some academic programs (think high schools and language programs), this platform is great. For others (larger universities), there are more robust CRMs needed (such as Slate, Salesforce, Jenzabar, Target X, Campus Management, Microsoft Dynamics) sometimes tied to a MAP (like Marketo or Pardot). Some of these tools stand on their own. Whether you’re setting up a CRM for the first time or trying to implement a new system that better meets your needs, the process can feel daunting. With so many different options out there how do you choose the right one for your institution? (Word to the wise, not Oracle). And what kind of Marketing Automation Platform will pair nicely with that CRM? Will Mailchimp suffice? The selection of the tool is one thing. And your team will need to evaluate all those features and options and price points. The Intead team has supported a number of institutions as they conducted these bake-offs. The RFP and evaluation logistics alone can overwhelm. Let us know if you need a hand. We are also experienced at diving into both institutional CRMs and MAPs to set up lead scoring, email workflows, landing pages, and other recruitment-focused activities to help our clients make the most of these robust systems – another thing to keep in mind! But in the end, no matter what you choose, the real success comes from the roll out and adoption. And that means getting everyone on board. 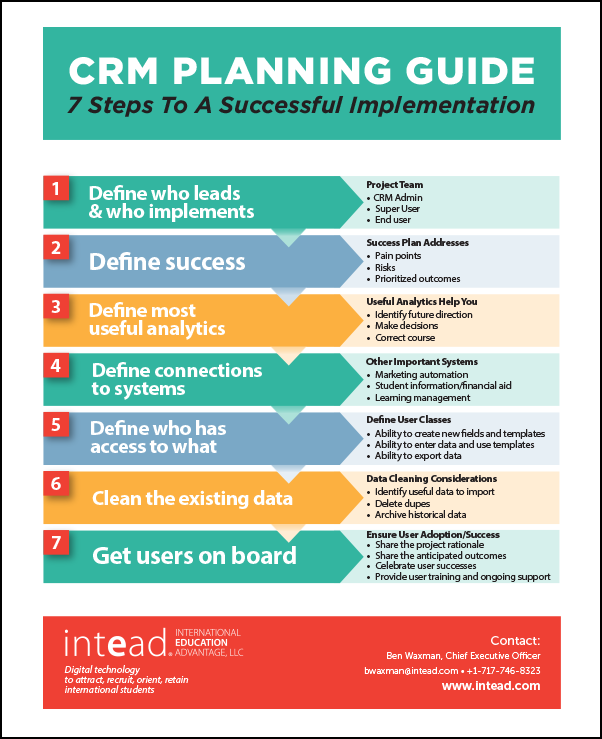 Intead Plus members can access a handy guide, 7 Steps to a Successful CRM Implementation. Our guide goes into each of the seven steps to CRM success in detail—but let’s go over the basics. Define who leads and who implements: Who is in charge of your system set-up and maintenance? Who are your end users? Define success: What problems are you hoping to solve? What outcomes are you shooting to achieve? Define most useful analytics: What data are you collecting? How will you use it? Define connections to systems: How will your CRM interlink with your MAP? Financial aid system? Student information platform? Define who has access to what: Who can set up templates? Enter data? Export data? Clean the existing data: How will you enter existing data—and what data needs to be there? How will you ensure that data is usable? Get users on board: Change is hard. Is your team ready for this new system, and motivated to make it work? Need some more guidance? Intead Plus members can access our full CRM Implementation Guide. Or feel free to drop us a line— we often work with academic institutions to guide their choice of a CRM system and implementation plan. It’s just one of the ways we help clients reach their enrollment goals, and we’re always here to support if you need us.